It’s one of the last oddities of gaming: The “Duke” controller. I first saw one in an FYE store, probably in December of 2001. There was one of those demo stations that used to be in every electronics store, this one an original Xbox—brand-new at the time—running Munch’s Oddyssee. I stepped right up, eager to play, and tried to wrap my very-normal-sized-person-hands around this enormous saucer-sized controller. 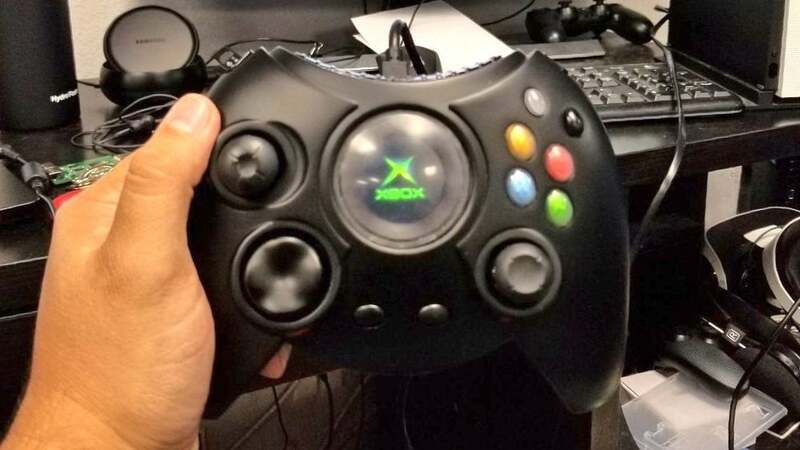 That was the Duke, the original gamepad for the original Xbox. And now it’s back. Seamus Blackley, who helped pitch and design the original Xbox, has apparently partnered with Hyperkin to bring the Duke to the Xbox One and Windows 10. Yup, definitely the Duke, even down to that original Xbox logo. There are a few changes, though. For one, that logo is actually an embedded display. Why? I don’t know. If it’s just to play back the Xbox start-up animation that seems excessive, but then again, the Duke is all about excess. The Back and Start buttons will also be renamed to the Xbox One’s uh...”Squares” and “Lines” buttons. Most important: You can’t see them in the image above, but there are apparently bumpers on each shoulder. Both the Duke and the Xbox S controller that replaced it were single-trigger gamepads, with the awkwardly placed “Black” and “White” buttons taking the place of the dual shoulder buttons of the PlayStation’s DualShock. It was awful, and we can all agree that dual shoulders was the far superior design. The Black and White buttons are still here for nostalgia I guess, but you should be able to safely ignore them. Anyway, it’s coming. Blackley tweeted out the above photo because the new Duke is officially Microsoft-approved and due to hit stores later this year for an as-yet-unknown number of dollars. What price can you put on nostalgia, anyhow?